In a 2-qt saucepan, heat oil briefly and add ginger and mustard seed. When ginger is fragrant and seeds are popping slightly, add chili powder and turmeric and cook for a few seconds. Add rice, water, carrot, brown sugar and salt and bring to a boil. Cover tightly, reduce heat to low and set a timer for 35 minutes. 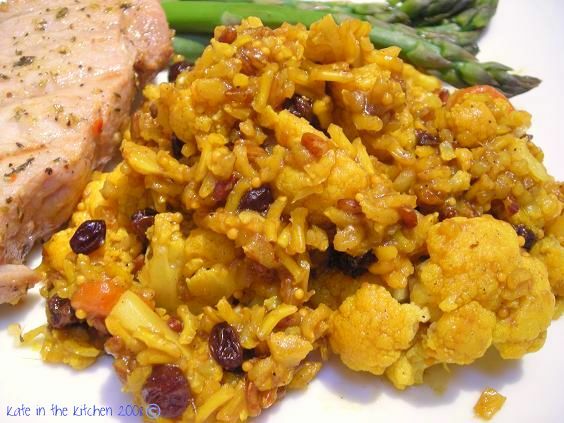 When the timer goes off, quickly put cauliflower and currants on top of rice, cover and cook for 10 more minutes. Remove pan from burner and let stand, covered, for 5 minutes. Stir in lemon juice and serve topped with scallions and pistachios. 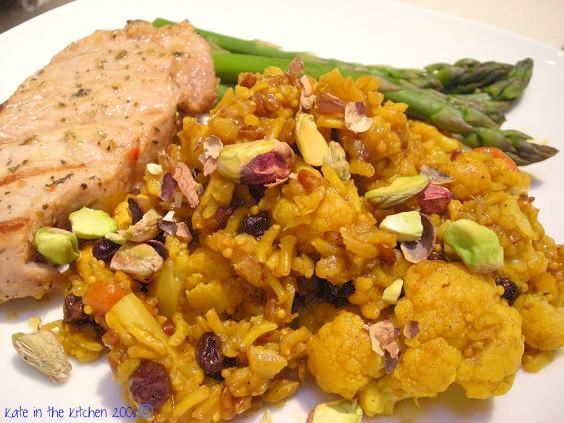 KATE’S NOTES: I used a combination of red and brown basmati rice for this dish and it was terrific. I felt that the finished dish was a little sweet; next time I think I will cut back on the brown sugar and maybe add less currants. By the time I added the cauliflower, all the water in the pan had been absorbed, so I poured in more, and it ended up cooking for a while longer than listed in the recipe, but it wasn’t a huge issue. The carrot, being small and thin had just about fallen apart by the time it was all done. Overall, it was a phenomenally flavored dish and I can’t wait to make it again. What’s Up! Just thought I’d respond. I truly loved this article. Keep up the outstanding work. that’s some good-looking rice. the color as awesome, and i love the additional of the cauliflower (i’m so glad people are starting to appreciate one of my favorite veggies!) and crunchy nuts. i’m with you and susan on buying bargain items. the prob. is, i do it too often and have a pantry full of stuff i don’t use b/c i forget it’s in there! this indian rice looks really good. i love adding raisins to savory dishes. (currants). also, love the idea of the crunch of pistachios. one of my favorite nut. I have learned that if there’s a bargain, get it. Don’t put it back or wait until tomorrow. Get it now. As for that rice, I’d like to get some it right now too. It looks great, Kate.